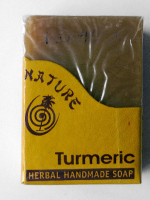 Pure herbal soap - high in Vitamin E - antiseptic. Packaging: All soaps are hand wrapped and delivered in attractive boxes. Directions: Miraculously suitable for the daily shampooing and cleaning of face, hands and the whole body while having a shower. It provides the skin with daily moisture and nourishment. The soap is known to help against psoriasis, loss of hair, acne and neurodermatitis. A regular application aids demonstrably the recovery of skin diseases. Therefore it is recommended for people who have allergies. As no artificial additives are used, and the main ingredient of the soap is olive oil. It is also suitable for baby skin care.